Well this past bow season is gonna be hard to beat. I have only been bow hunting for the past four years. 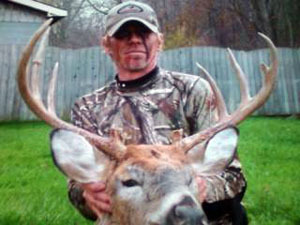 I have been an avid hunter since I was a kid, and have taken some very nice bucks with shotgun. I passed on probably twenty to twenty five deer during the past four bow seasons waiting for the right deer (BUCK) to come into my comfort zone. 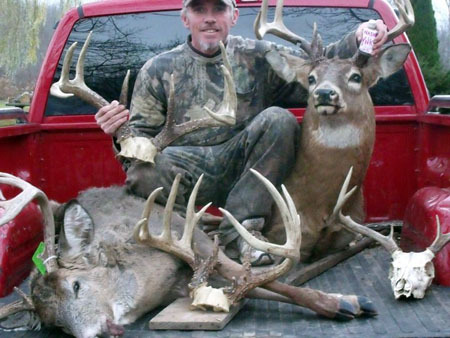 I watched two monster bucks on my property growing horn all summer long and knew they were there. Sure enough, one morning about 8 a.m. I had a doe walk by and you know what happens next! She looks back, and like a text book hunt here he comes and stops 22 yards broadside. Seemed like I had forever to think about everything you are told to make that perfect shot. Thanks cuz Bob Webber! And Whak!! A Rage in the cage!! I was as calm as could be until I saw the fletchings in the smoke 'em zone!! Then I sat and shook like a bag a bones, waited a couple hours, and gathered him up! What a hunt. I am a hunter forever! !